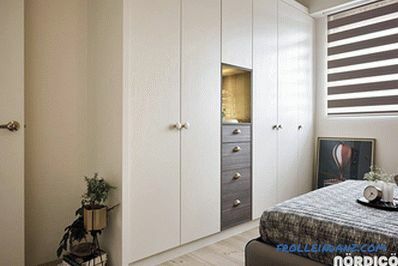 Modern Scandinavian design style, as is known, originated in the middle of the last century. This period is marked by a coup aimed at combining form and function in order to create comfortable and affordable living conditions. What are the distinctive features of this style, one of the most popular at the moment? 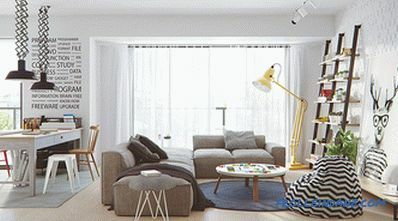 The Scandinavian interior can be bright or muted, minimalistic or very lively and creative. In fact, it includes a wide range of styles, with a wide variety of styles. But, most importantly, it is functional and simple. 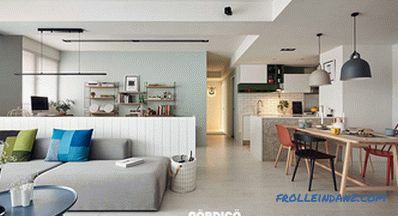 In order to form an idea of ​​what the interior of a Scandinavian-style house is, we suggest you walk through eight stunningly beautiful houses that embody the basic ideals of this style, but interpret it differently. Design of the house number 1. Bright interior with an open layout. 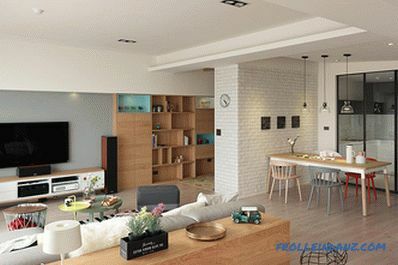 The visualization of the first design project was done by aTng design studio. 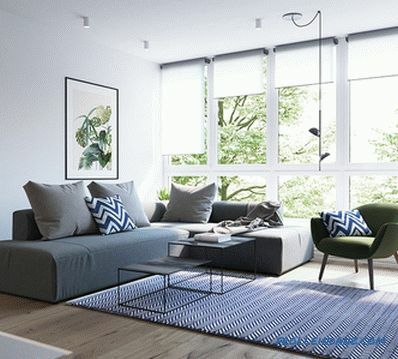 A bright open-plan dwelling is the perfect place to embody the modern Scandinavian style. 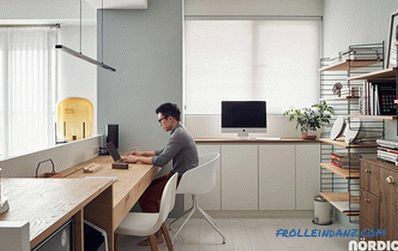 This room simultaneously performs the function of a living room and a home office. The first thing that catches your eye when you cross the threshold of this room is a dapper deer in big glasses, a sort of hipster from the animal world. 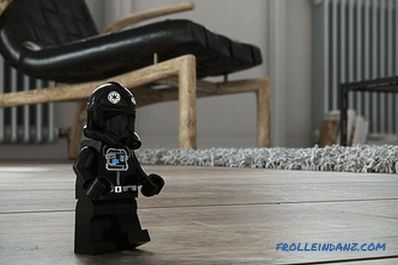 This funny picture makes the space less serious. A yellow lamp will not only amuse, but also create a microexplosion of color. 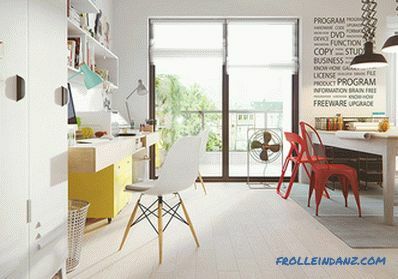 Since this room also performs the function of a home office, there is everything you need for productive work. 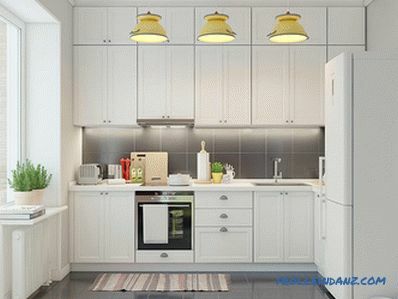 White cabinets hide important documents from prying eyes and help keep the workplace in order. 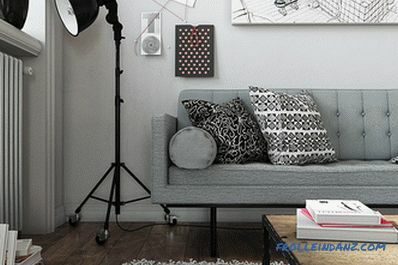 Pictures along the wall add individuality to the home. Living plants both indoors and on the balcony make the room alive. 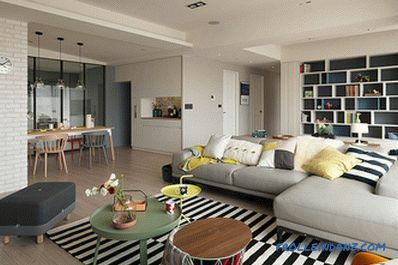 Here you can see the living and dining areas. The designer did not stint, placing art objects on white brick walls. On the left, in the immediate vicinity of the floor - a deer, about which we have already spoken, and a dog. On the right - a whole series of images in graphic style, and they are located higher than the left picture. This is an interesting use of contrast. The works, hung above, draw attention to two lamps, identical in shape, but painted in different colors. 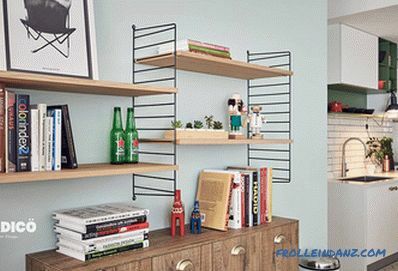 This bookshelf is artfully filled. 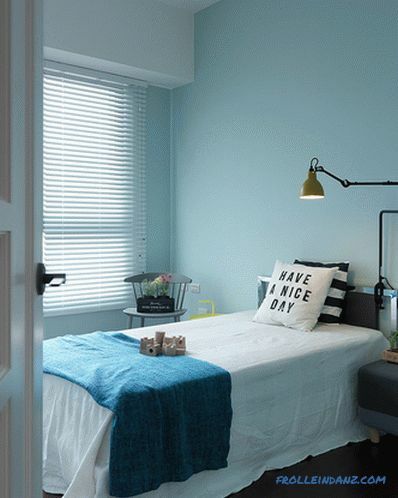 There is a perfect balance of vibrant greens, bright colors and unpretentious gizmos. Books are located on different shelves in different ways. Negligent strokes of yellow and green are combined in a single color scheme. 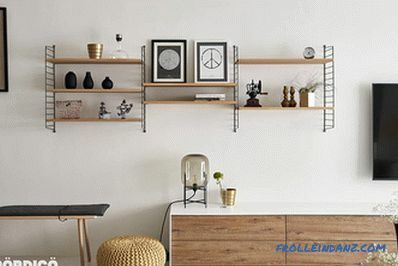 Modern Scandinavian design has always been and remains, on the one hand, very functional, on the other - able to find beauty in the most simple objects. 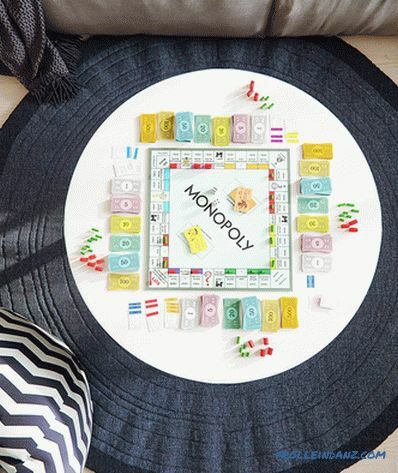 This image of the game "Monopoly" demonstrates the idea that living space is intended primarily for life. 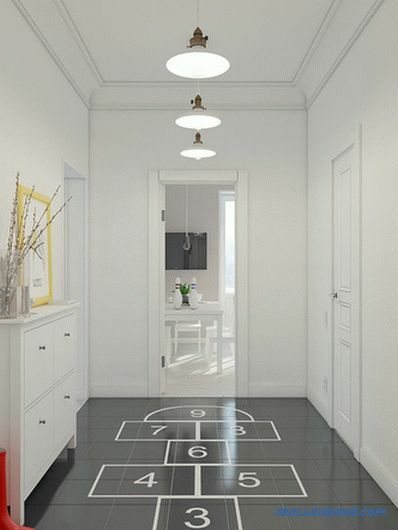 Family members can sit around this unpretentious rug and have a nice evening playing! 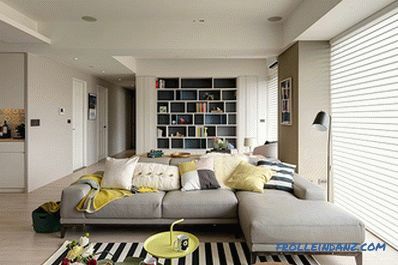 The yellow color helps to refresh the space. 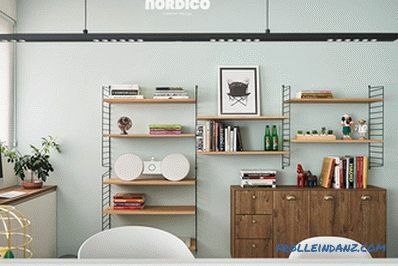 Initially, this home office was decorated in the traditional Scandinavian-style white palette, but then blotches of bright colors were added to it, and the room was transformed. Emerald lamp, yellow pedestals and red chairs make the room less flattened, give it extra volume. 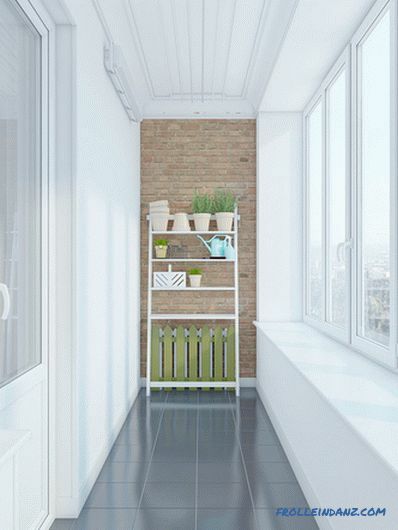 Green plants on the shelves seem to unite the internal space with a balcony outside the window. Is there anything else interesting in this room? Undoubtedly, this is the text written on the wall. The most uncomplicated text can turn into a work of art if its large black letters stand out against a white wall. 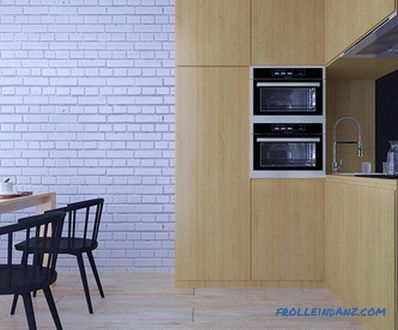 In every home designed in a modern Scandinavian style, you can usually find an iMac. Why? Apple is based on the same principles as this design style - simplicity is beautiful, and there is no need for excesses. IMac is elegant and luxurious. It fits into the surrounding space (to a large extent, this is due to the fact that this computer is decorated in silver or white), but at the same time it stands out because of its high prestige. Karina is not necessary to hang on the walls. 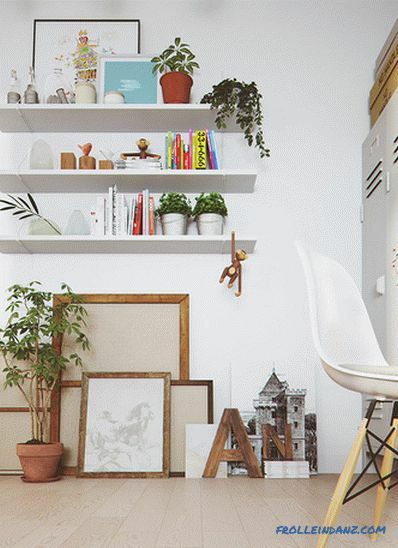 In this room, the shelves are filled with bright books and cute knick-knacks that serve as accents. Under the shelves are placed overlapping wooden frames. This creates a sense of style. If you add a living object (for example, a houseplant) to the foreground, you will get a masterpiece! And all this thanks to the versatility of objects and the diversity of their textures. In this style, breaking the rules is normal. Chairs do not always have to be the same, and the paintings do not have to be framed.You may notice that in this working area all the seats are different - there are two red chairs of different styles, one wooden chair and a white stool! The pictures hanging over the computer are not framed and arranged in some sort of confusion. This demonstrates the spontaneity of art and serves as an example of how easily even the most heterogeneous collection can be combined. The dining area is open to the rest of the large space of this house. 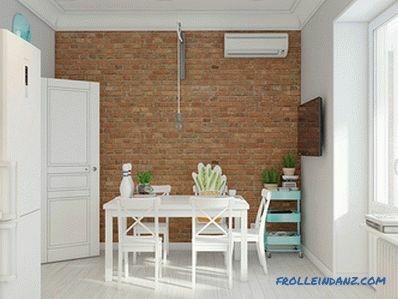 Creating a wall-gallery, like the one that is located behind the dining table, you can cover the whole wall or only a part of it with paintings. The designer mixed photographs, wooden tablets and canvases to tell the story he had invented. The lamps above this art exhibition reinforce the effect created. House no. 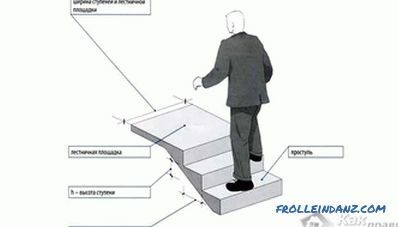 2 design. White interior and many bright colors. 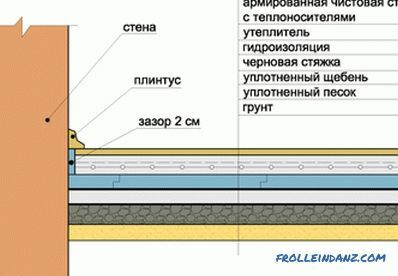 The visualization of the next design project was made by Alexander Vezlomtsev from Line Design Studio. This house is similar to the first, but it does not use so many bright colors. 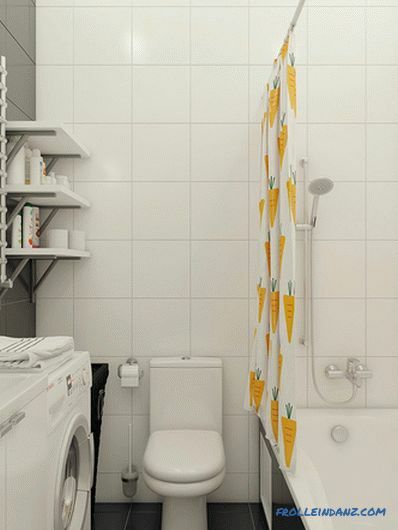 However, the colors that add life to a sterile white room, there is still - first of all, it is yellow and green. In this living room, large windows behind which green trees are found are complemented by a picture hanging over a gray sofa. The greens outside the window are emphasized not only by the painting on the wall, but also by the chair of natural green color. 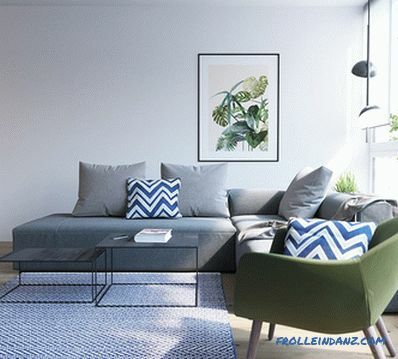 Blue chevrons on cushions give the room more texture. There is a lot of white in this modern aesthetics, which lays the foundation for bright colors and functional, but stylish things. The TV, which is shifted to the side, provides access to a wooden cabinet with books and various trinkets. The bright roots of the books add more color to this seemingly boring wall. And it was not without Apple! In this office there are less colors than in the first one, it is simpler and more concise. A large window allows you to take a break from work and focus on what is outside, the trees behind the glass give the room an element of naturalness. 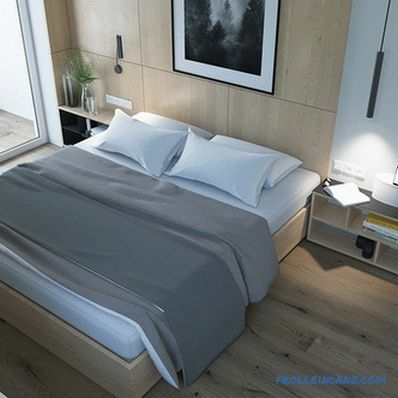 The bedroom in a modern Scandinavian house should be as simple as possible, since it serves exclusively for recharging. At least superfluous! Only one picture is hung above the bed. Every accent - from the image of trees in the photo to the leaves of the fern on the bedside table - directs you outside the house. Exterior elements play a special role in the design of the whole house. Addition to the photo, which still beckons to slip out of the house, is a balcony. The furniture on the balcony indicates that the owners spend a lot of time there. 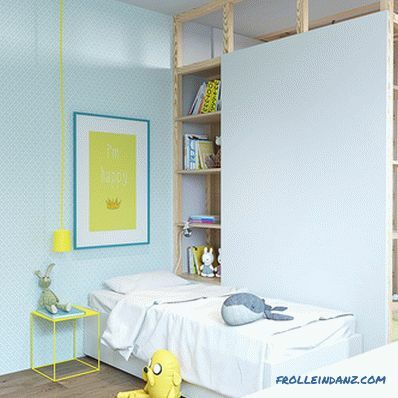 The children's room is the same style as the rest of the house, but it uses bright yellow shades to bring joyful mood and playfulness to the space. The bed remains simple, large bookshelves filled with baby things. The yellow bedside table is perfectly combined with a hanging poster. 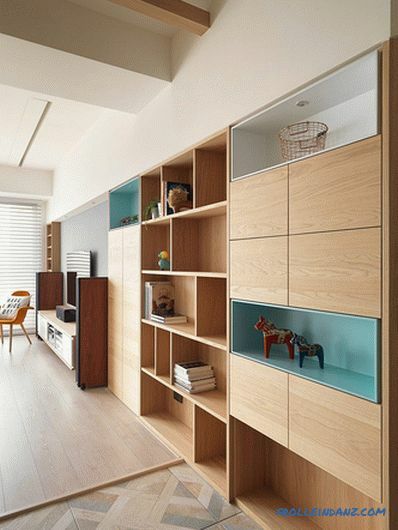 The designer chose a built-in stationary placed along the entire length of the room for the usual desk. This table is ideal for a child’s size, and nearby windows ensure good lighting while working. There is not much yellow in this part of the children's room, but you can also see it here - in the picture placed on the table and in the lamp next to it. The rest of the homework zone remains simple and natural. In the play area there are small stools and a very large picture on the wall. 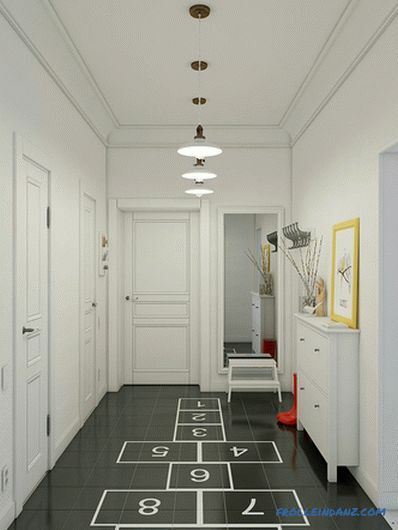 The latter makes it clear that the space is intended for a child, and gives the room more color. There is enough free space on the built-in shelves to hide toys. 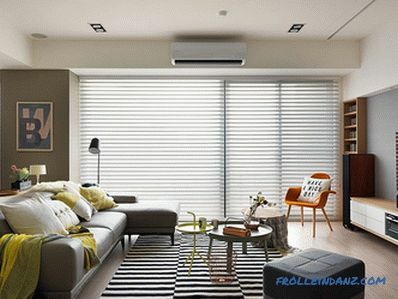 A hall decorated in shades of gray is associated with an industrial-industrial room. 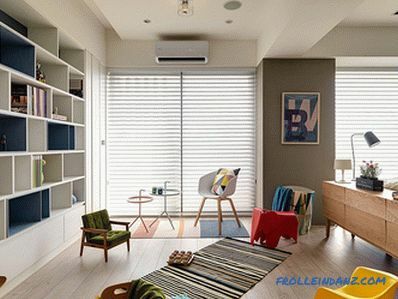 The amount of furniture here is kept to a minimum: there is a bench on which to sit, a hanging hanger for outerwear and bags, as well as a built-in shelf for keys and other small things that you may need when you leave the house. There is nothing excessive in the kitchen, so it is good. Above the dining table - round lamps of unusual shape. The green highchair serves as an indication that not only adults, but also a baby dine around this table. 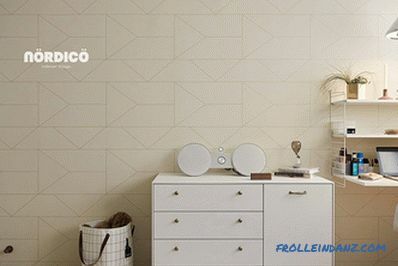 A geometric pattern created with the help of a tile makes the room even more interesting. A large window invites green trees into this cozy room. Looking at the table and the surrounding space from the top, you can see how high the green high chair looks in contrast to the rest of the interior elements. On the left is a black wall on which you can draw with chalk! Thanks to the high cabinets, the kitchen looks much larger than it actually is. 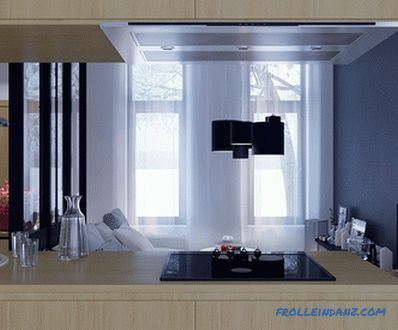 Kitchen appliances are built-in, which also saves space. 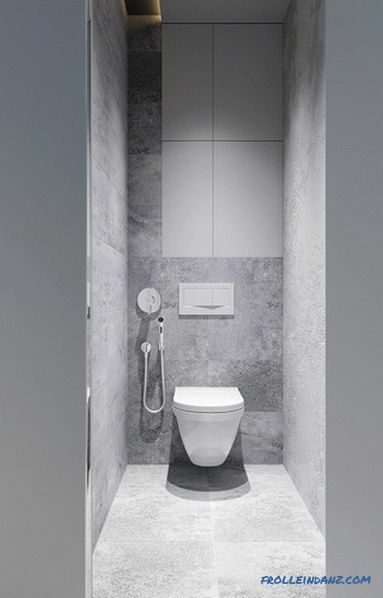 The bathroom in this house is also made in a modern style. 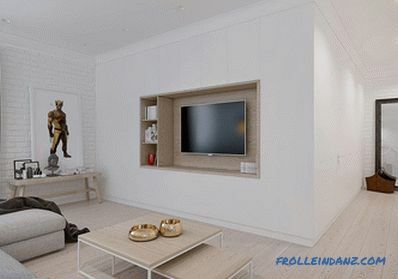 There is no need to add stylish accessories - the room is as simple as possible, because it is intended to perform its strictly defined functions, which means that there should not be anything extra. Design of house number 3. 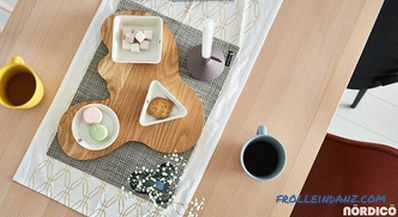 Combination of traditional and modern Scandinavian motifs. The design of this bright and spacious house, designed by Konstantin Kashchuk, includes a variety of traditional Scandinavian themes, but modern influences are also felt here. 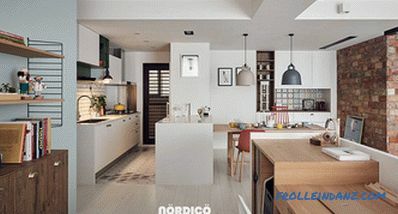 For example, light-colored parquet floors are a return to the classic Scandinavian style, while the streamlined shape of furniture is a product of modern trends. 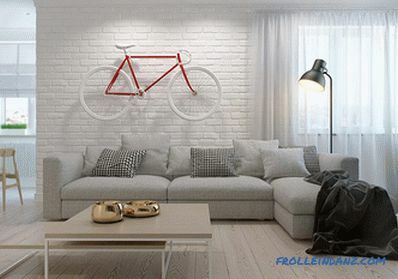 Are you surprised by the bike hanging over the sofa? 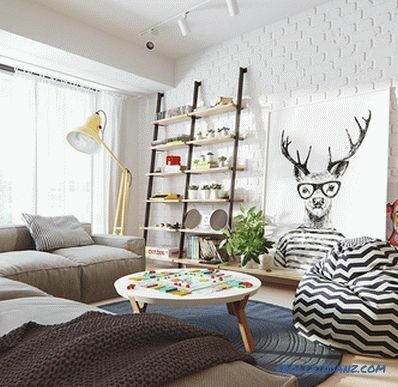 Acquaintance with a quirky and playful decor still awaits you ahead. 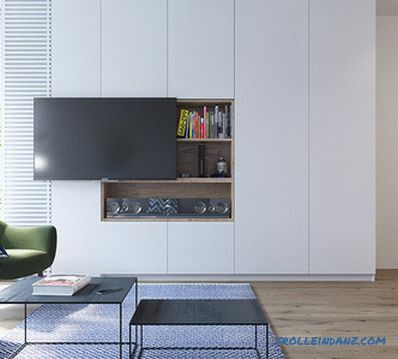 The main attraction of the living room is a TV recessed into the wall in a frame of the same wood that is used on the floor. 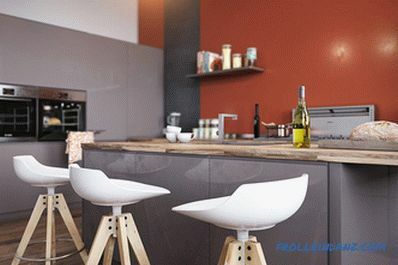 Red accents bring visual energy to the kitchen. 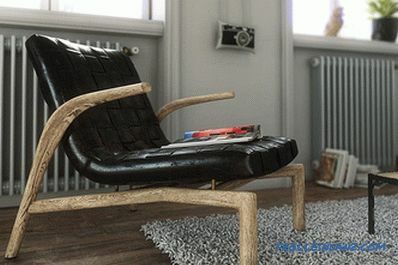 The iconic CH33 chairs by Hans Wegner (Hans Wegner) are one of the most famous products of Danish design. 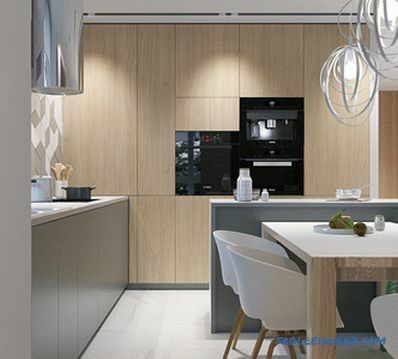 Here they serve to bridge the gap between the natural tones of wood used in this space. 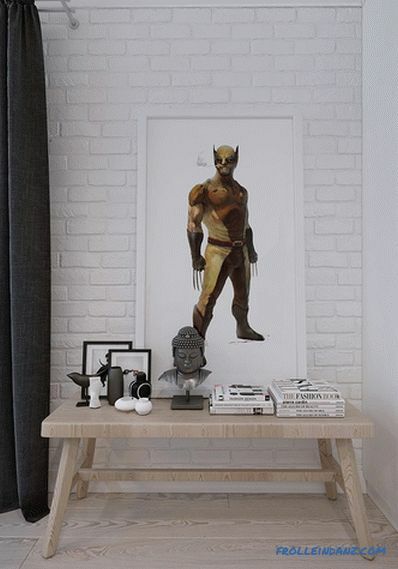 A painting depicting a superhero Wolverine in pop art style joins a collection of sculptures and ceramics on a small table hidden in a corner. 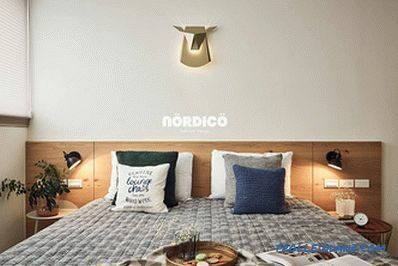 The basis of the bedroom's artistic theme is portraits on the floor and huge letters made of wood. A soft carpet under the bed will allow you to keep your feet warm when you get out of bed in the morning. 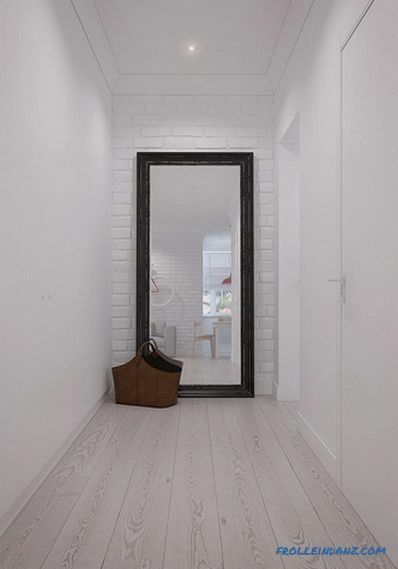 Warm wood and bright white tones of the walls and ceiling serve as a decoration in their own right - additional accessories are no longer required here. Design house number 4. 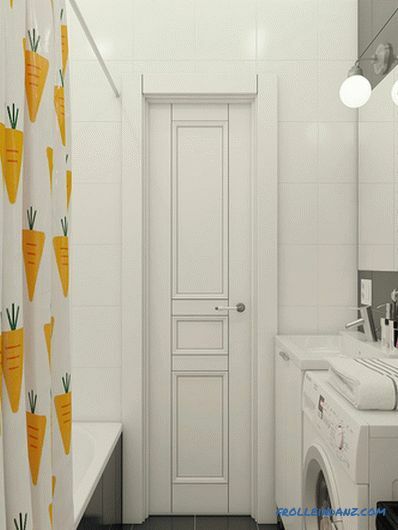 Stylish Scandinavian interior with a playful character. Without a doubt, you will fall in love with this house at first sight! All of us (or almost all) are still children somewhere deep down, and designer Anton Medvedev knows how to please this inner child, how to please him. 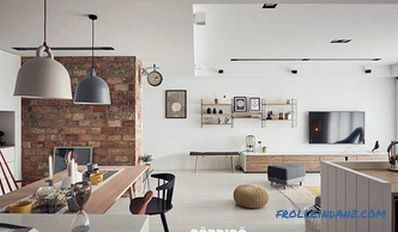 That is why he filled the space of this house with elements with a playful character, which, however, remain at the same time stylish and highly artistic. 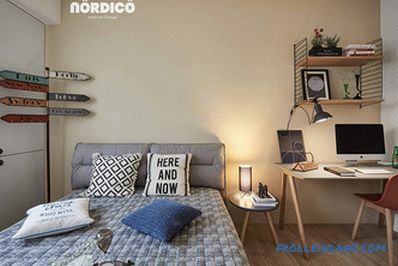 Scandinavian décor often looks like a breath of fresh air, thanks to its youthful energy and uncompromising honesty. 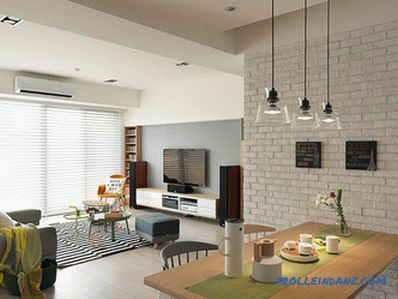 And this modern interior is a good example. As soon as you cross the threshold of this house, you will see the good old "classics" who welcome visitors with their charming simplicity. Well, who can resist here? Charming and at the same time functional accessories make you feel at home here. 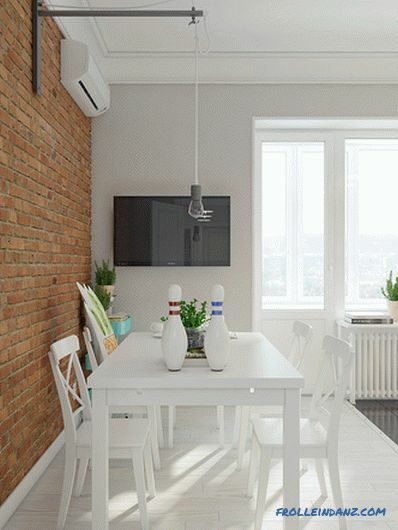 The dark brick wall and the snow-white floor seem to turn the living room space 90 degrees. The cushion in the shape of a houseplant and the pins on the table seem eclectic at first glance, but they are an excellent way to show the interests of the hosts in a unique and inspiring form. Pay attention to the textured wallpaper on the far wall - barely noticeable but stylish! Of course, this garden is on the balcony - absolute perfection. What is just a nice decorative picket fence. A wallpaper with the image of colorful buttons and a smart ironing board are prepared for your acquaintance with an amazing dressing room. Most likely, it will look just as good, being filled with bright clothes. 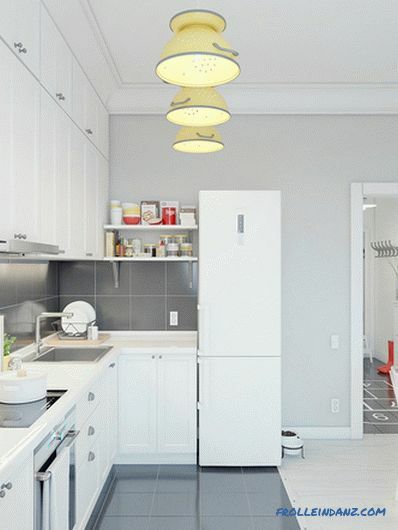 Pastel yellow colanders got a second life as pendant lights in this magnificent white kitchen. You can implement this interesting idea at home. 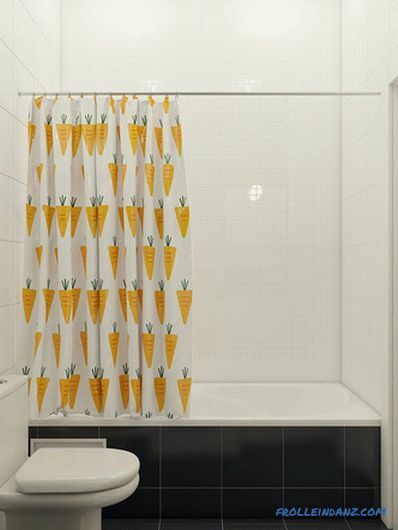 The black and white tile will give the bathroom a simple and serious look, but the shower curtains with the image of a charming carrot will give individuality and an abundance of joy. 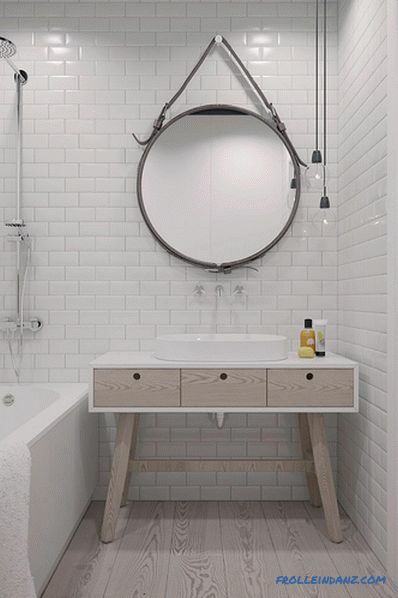 Minimalistic tiles are an excellent choice. 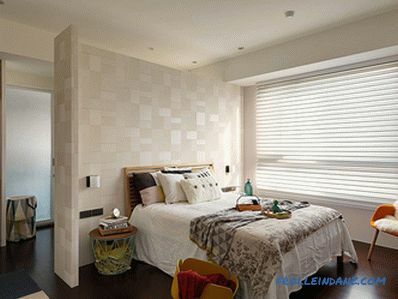 With an abundance of decor, the room will look too cramped and cluttered. 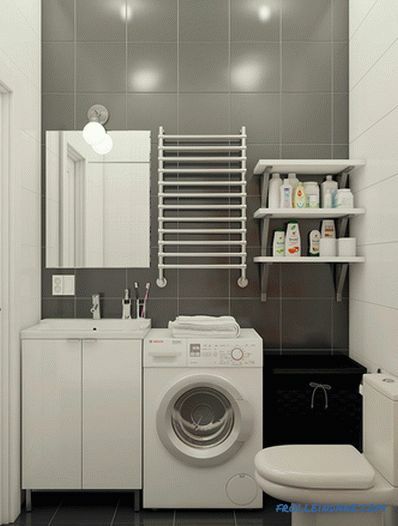 What an efficient use of space! Not a centimeter wasted. Design house number 5. The interior with a calm and relaxing atmosphere. Interior designer Zinaida Baklanova, still a child, lived for several years in Sweden and gained invaluable experience there, which was useful to her in her professional activities. 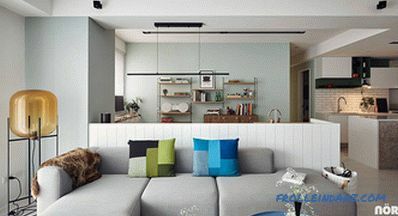 She realized that the designer’s goal was not to imitate any particular style, but to capture his overall atmosphere and personality.Everything in this living room, ranging from the location of objects and ending with the color scheme, was chosen by her to create a calm and relaxing atmosphere for the owners of the house who want to socialize and relax at the end of a hard day. 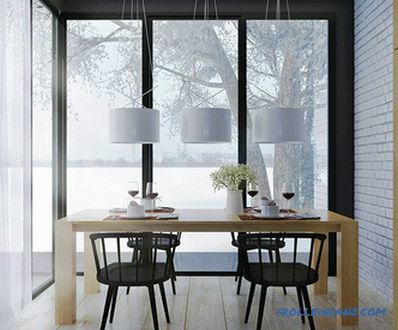 The dining area is incredibly bright and spacious, even though it takes up little space. Very wide floorboards and thick table legs create a sense of scale. 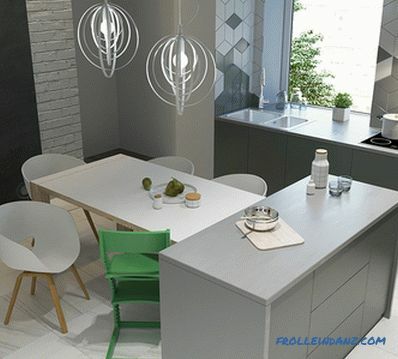 The compact kitchen serving as the center of the house is located between a very bright dining room and a somewhat dismal living room. 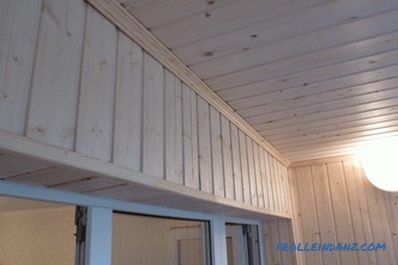 Warm natural wood contrasts beautifully with the bluish tones that are present in all other parts of the house. 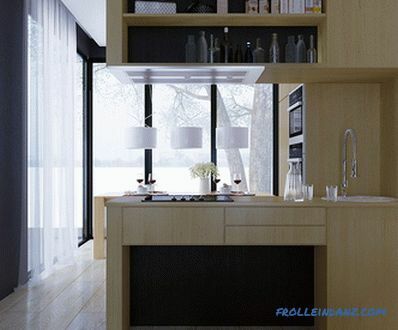 Against the background of a kitchen island, two tall narrow windows, curtained with curtains of thin translucent fabric, look great, creating a feeling of unearthly lighting. 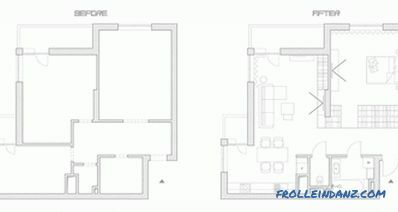 Design of house No. 6. 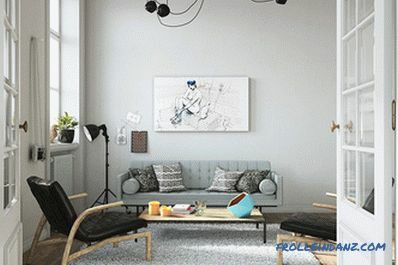 Scandinavian interior with eclectic elements. 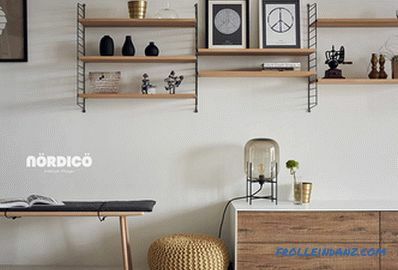 French designer Aurélien Brion used a particularly interesting approach when designing the interior in the Scandinavian style, with the result that the house turned out elegant and defiantly friendly at the same time. 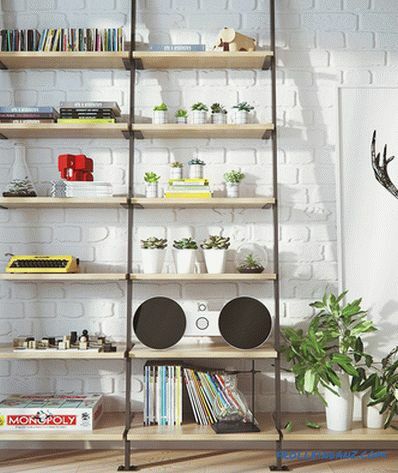 In terms of decor, this dwelling looks eclectic - the variety of colors and styles is a reflection of the diversity of tastes and interests of the host. 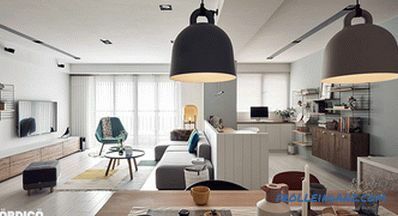 Those who want to transform their own homes and apartments can be endlessly inspired by looking at this interior with a touch of Scandinavian charm. There are so many funny things here! Photographic spotlight, cloth on the pillows with a nice print, as well as various pieces modern art - there is something to look at. 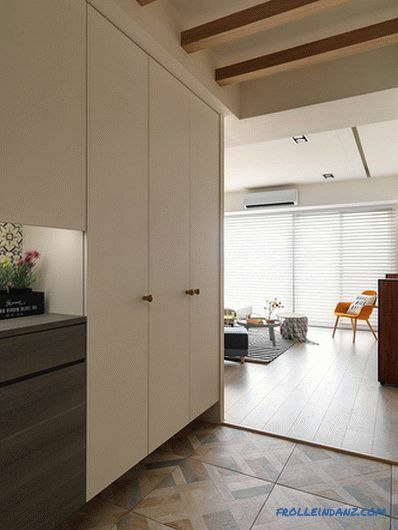 The flooring look and natural-looking armchairs give the room an organic personality. The bedroom is particularly concise! 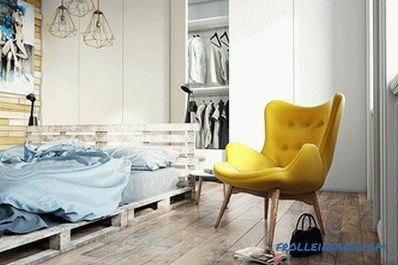 The bed frame is made of old pallets (sustainability is another distinctive feature of modern Scandinavian design). The bright yellow chair was created clearly not for the Scandinavian interior, but it fit perfectly into the overall aesthetics of the space. 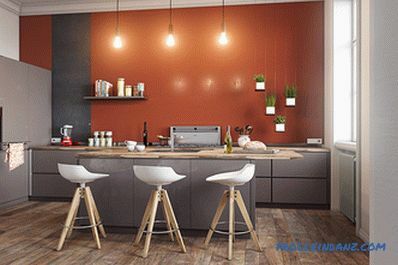 The rusty orange color in the kitchen creates a big splash of passion, and against this background this delightful hanging garden looks very contrast. 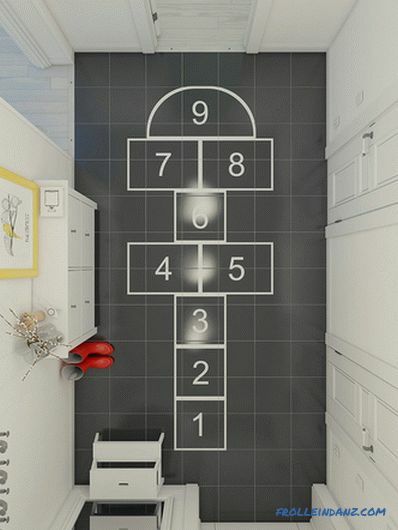 House number 7 design. 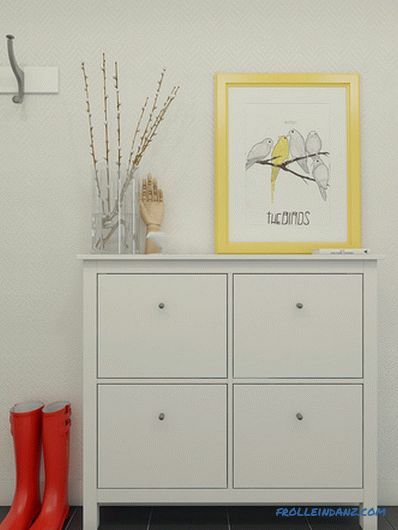 Light shapes and simple surfaces are Scandinavian style classics. 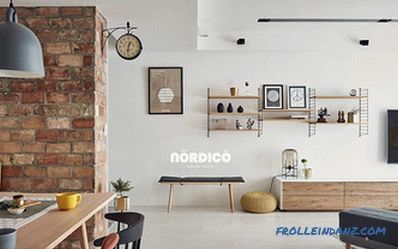 This beautiful interior with its simple shapes, light surfaces, easy carelessness and at the same time remaining consistency remains true to the fundamentals of the Scandinavian style. But at the same time, he challenges many templates that can be found in thematic journals. 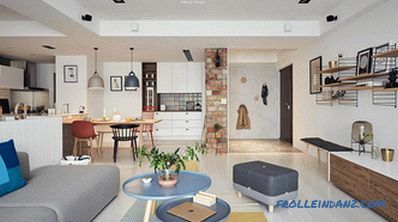 This interior rejects minimalism in favor of an interesting ornament and bright colors - in fact, it is a more realistic reflection of everyday decor in the north. As a result, you will truly feel at home here. Almost all the colors of the rainbow are used in the interior design. In countries with a cold climate, where the Scandinavian style originated, these cheerful colors help to survive long and dark winters. The open layout allows sunlight to penetrate the furthest corners of space. 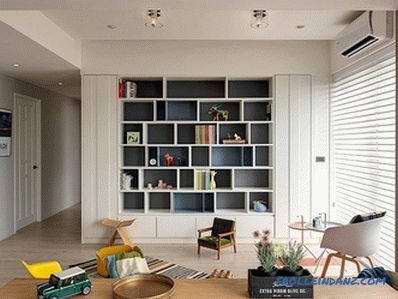 In addition, thanks to her, the owners of the house will not be able to leave their guests even in those moments when they will be forced to do urgent tasks - look after children or finish urgent work in their home office. 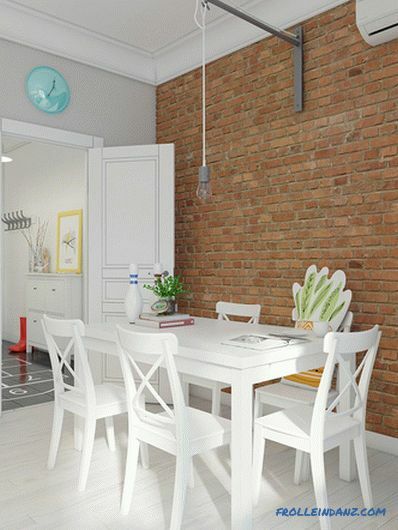 This solid brick wall provides visual warmth and helps separate the hallway from the living room. Double-sided clocks, like those used before at railway stations, let you know the time, regardless of whether you are in the living room or have just entered the house / are going to leave it. In the interior design of the room extremely bright colors were used. 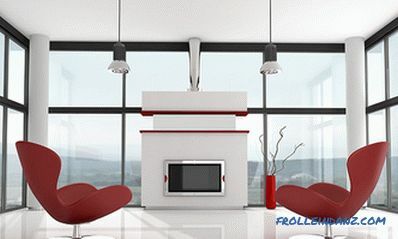 The dominant color of the living room is blue, in the dining area dominates red. This beautiful emerald chair is the work of designer Hee Welling from his Lounge series. A tile of unusual geometric shape draws attention to the kitchen floor — this element is often overlooked in open-plan houses. Eclectic chairs always make the dining room look fun and carefree. 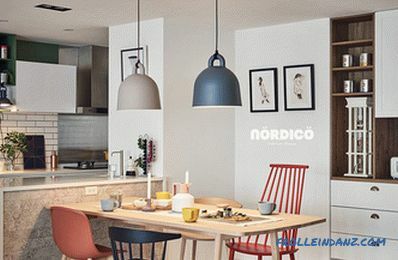 The collection, assembled in this dining room, includes a variety of chairs - from classic to modern, including the work of Danish designers Paul M. Voltaire (Poul M. Volther) and Jorgen Baekmark and British designer Sebastian Rong (Sebastian Wrong). 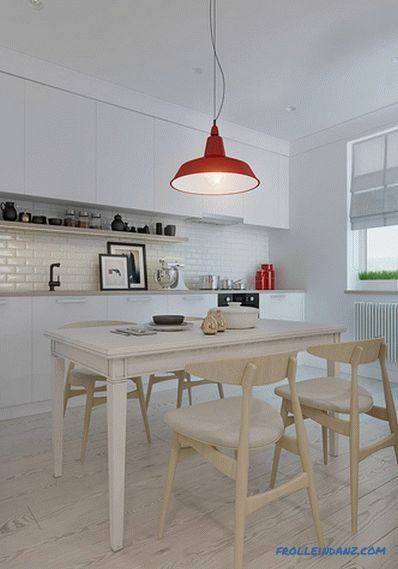 Huge pendant lights are definitely the epitome of functionality associated with Scandinavian design. They are from the Bell Lamp collection of Danish designers Andreas Lund (Andreas Lund) and Jacob Rudbeck. .
Don't you like this unusual tray? It imitates the characteristic curves of the legendary Savoy vase by the famous Finnish architect Alvar Aalto. The drawing on the wall is also associated with the name of Alvar Aalto. This is a minimalist image of the popular beehive shaped lamp he created. Not far from the entrance is the smoky Oda table lamp by Sebastian Herkner. There is a bench right there, which will be very useful when you need to take off your shoes when you return home after a hard day at work. This home office overlooking the living room makes the work extremely comfortable. Numerous shelves and storage cabinets contain all the reference materials you may need in your work. Dalecarlian horses (or Dala horses) are known worldwide as some of the most beloved and popular products of Swedish folk art. Such toys first appeared in the province of Dalarna and quickly turned into handicrafts. This craft has its own rich traditions that vary by region. 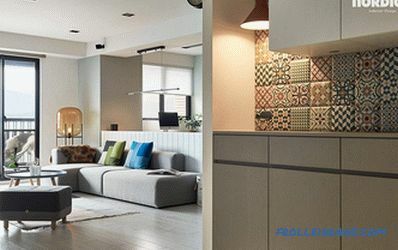 Next to the entrance door you can see eclectic tiles with rich colors and playful décor. This cozy bedroom is striking thanks to the rich variety of colors and textures of the pillows that lie at the wooden headboard. Blue, green and yellow accents continue the palette that started in the living room. At the foot of the bed you will find the simplest things, and not TV at all, as is customary in many homes today. But this is not boring at all - for example, we really liked this decorative niche with lighting and the birdcage standing inside. Creative artificial taxidermy offers an excellent alternative to trophies that can be found in northern hunting lodges. In front of you is the second bedroom of this house. 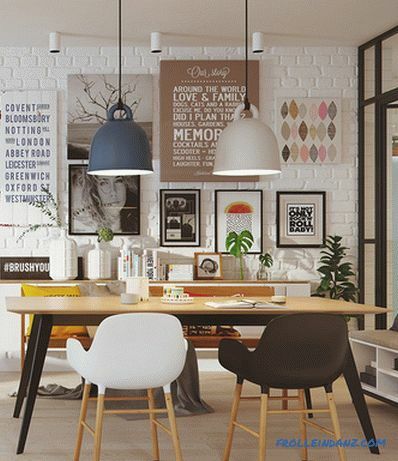 All types of typography fit perfectly into modern Scandinavian interiors. Words draw attention in a natural way. Design of house number 8. 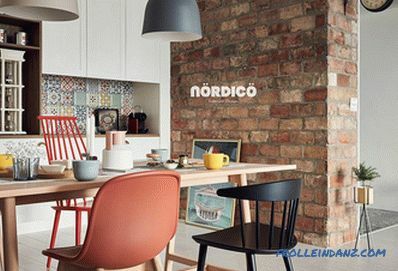 Scandinavian interior with bright colors and bold patterns. While the previous house cultivated relaxed aesthetics, this interior has a more adventurous approach with bright colors and bold patterns. White walls are the hallmark of Scandinavian design, but in this house they play a particularly important role. If the surface of the walls were painted in any other colors, they would distract attention from the magnificent furniture and textiles that define all functional areas. The space between the zones remains free, open, uncluttered, that is, absolutely corresponding to the ideals of the Scandinavian style. 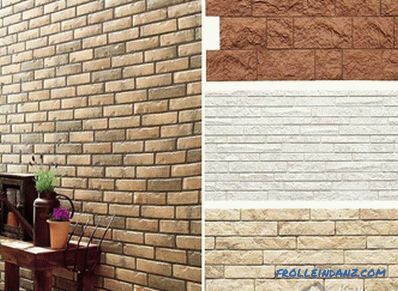 The room palette resembles the colorful rows of houses that are found in the coastal northern cities. There, these bright colors allow you to fill your life with a dark northern winter; they seem to attract the summer, the sun and the wildflowers. Almost all the furniture in the living room seems very soft due to the rounded edges. 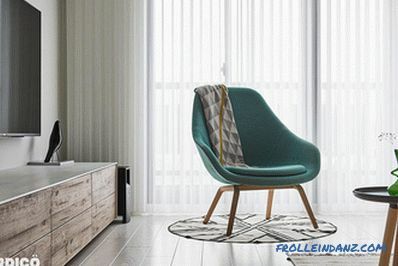 In general, smooth bends are very characteristic of Scandinavian furniture, especially since the 1960s – 70s, that is, from an era called Mid-Century Modern. 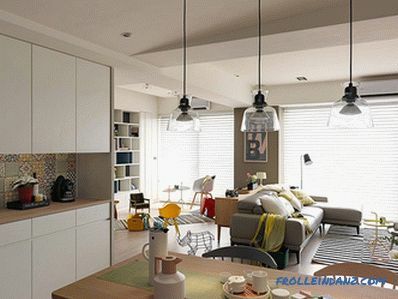 However, in general, the interior of this house in the Scandinavian style looks very modern. This contributes to the contrast between the furniture with smooth forms and linear elements such as carpet, shelves, and blinds. Danish designer Thomas Bentzen worked on the creation of both coffee tables. Yellow is from his series Don't Leave Me, and the green table is called Around. A super-useful combination of the trash can and coffee table - from the Scandinavian design brand Ferm Living. 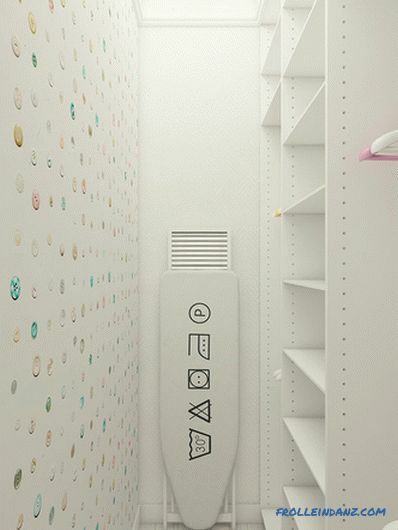 The built-in shelves at the front door are designed to store decorative items. The same purpose is served by a long chest of drawers that have occupied unused space behind the sofa. This children's area is incredibly charming! 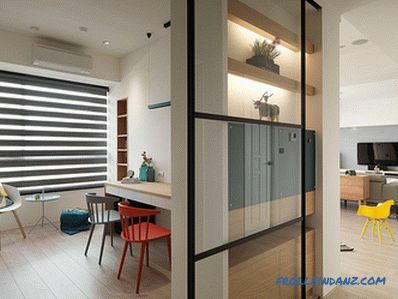 Small family members have received their own tiny living room for their use, and miniature versions of famous designer chairs will make their stay here as comfortable as possible. Thanks to the various partitions, it became even more convenient to use the bookshelf. Children can pick out their favorite books and enjoy reading or play with the colorful Dala horses. The small kitchen and dining room got the darkest and most secluded part of the living room with an open plan - here no one will disturb you to cook dinner or enjoy a cup of tea with dessert. The kitchen apron is decorated with an eclectic tile that combines the pastel color palette of the dining room with bright colors of the living room. 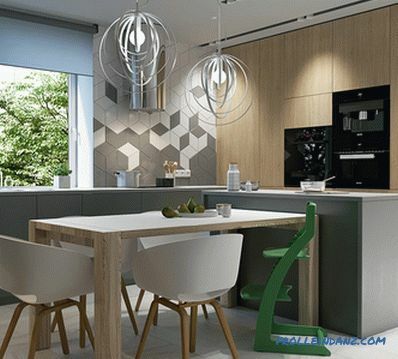 When arranging the dining area it is necessary to remember about the proper organization of lighting. Above this dining table weighs three pendant lamps at once, due to which the entire surface of the table top is well lit. 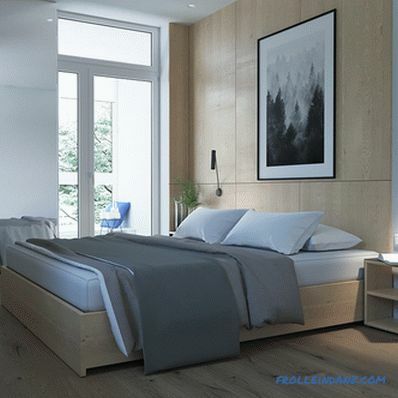 What a charming bedroom! 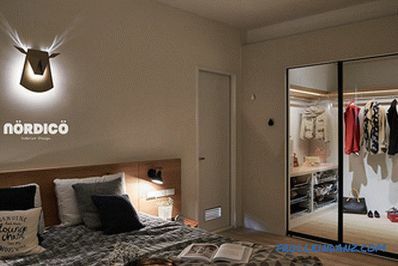 The main idea realized during its design is simplicity and convenience. 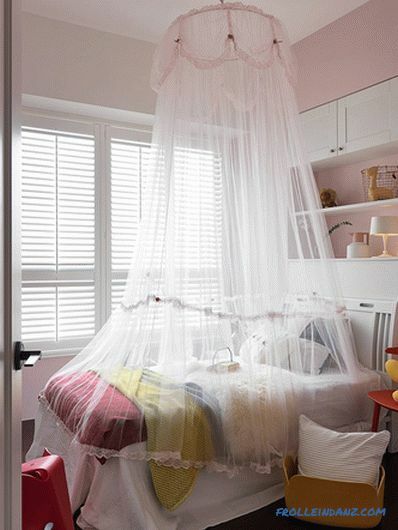 The other bedroom is designed for a child, and this can be seen at a glance - bright children's furniture, pastel color of the walls and a fancy canopy over the bed. 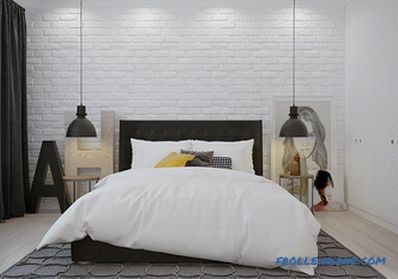 This bedroom is a bit simpler, probably it is intended for an older child. We can assume that the lad has an interest in gardening - just look at all these plants in tin pots. It is good that children have such wonderful bedrooms in which nothing prevents them from quietly relaxing, but one should not forget that they still need to do their homework somewhere. This cozy office is ideal for reading and preparing for a new academic day.